1. Place all vegetable ingredients in 4 bowls. 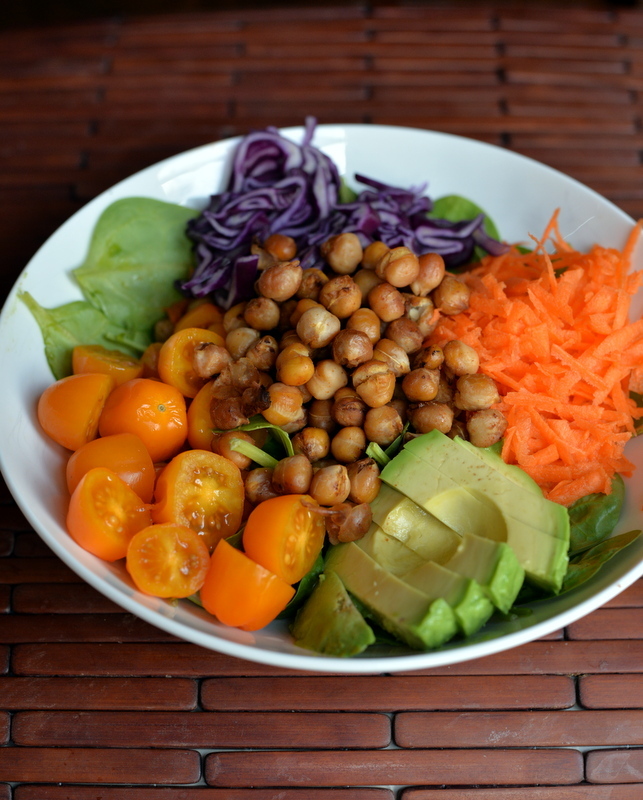 Top each bowl with 1/4 of the BBQ chickpeas. Drizzle with lemon juice. Author’s note: I was tooling around in the kitchen making versions of chickpea bacon, but multiple people told me these taste like BBQ chickpeas instead of bacon. No loss, eh? These are absolutely fantastic for snacking on. You may want to make a double batch, as these are super addictive! They make a great salad topping. 1. Preheat the oven to 450°F. In a medium bowl, stir together the liquid smoke, sesame oil, black pepper, smoked paprika, nutritional yeast, maple syrup, sherry, tamari, onion pow- der, and garlic powder. This is your marinade. Add the chickpeas to the marinade and stir to coat. 2. Transfer the chickpeas and marinade into an 8×8-inch baking dish lined with parchment paper. Bake the chickpeas for 15 to 20 minutes, stirring once or twice. The chickpeas will get crispier as they cool. Store in a lidded container in the refrigerator. These are even better, if possible, on the second day. Tomatoes, cucumbers and kale especially in season. I love veggies! What a fabulous-sounding cookbook! Thanks for hosting the giveaway. At my house, foods we eat in abundance include carrots, beans, rice, whatever fresh fruit is in season, tomatoes in a variety of forms. I love Swiss chard and collard greens as well as kale; and I use lentils (several varieties) in as many dishes as possible because they’re so versatile and are among my favorite foods. 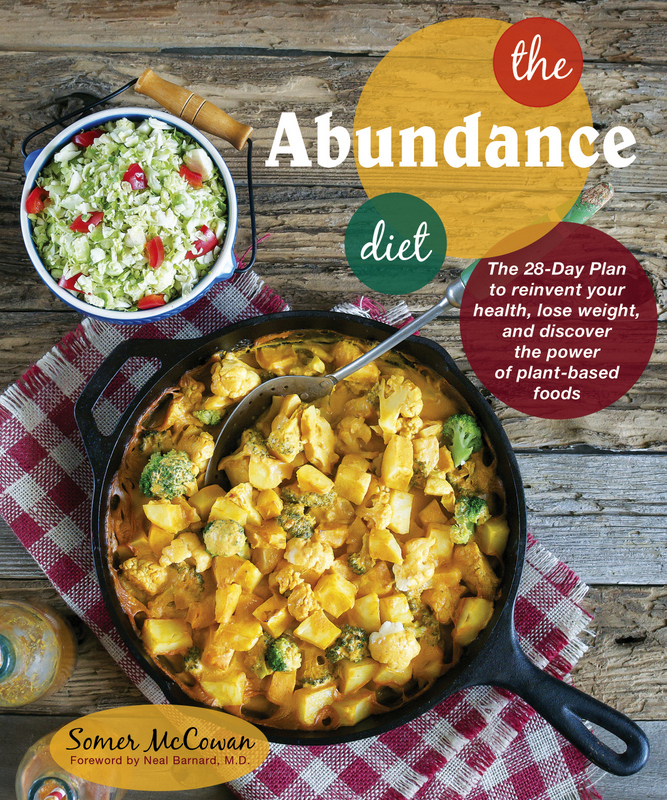 I borrowed The Abundance Diet from my local library and would lover to have my own copy! Thanks for posting some recipes from the book, and thanks for the giveaway! I tend to not eat large amounts of any given item. I probably eat pasta most, and salad. This book sounds like it has some tasty recipes. Thanks for the giveaway! Love the concept of the book! I like to eat blueberries in abundance! I like to eat chickpeas in abundance! I love to eat tomatoes fresh from the garden! I love to eat legumes in abundance, so am eager to try the BBQ chickpeas — thanks! 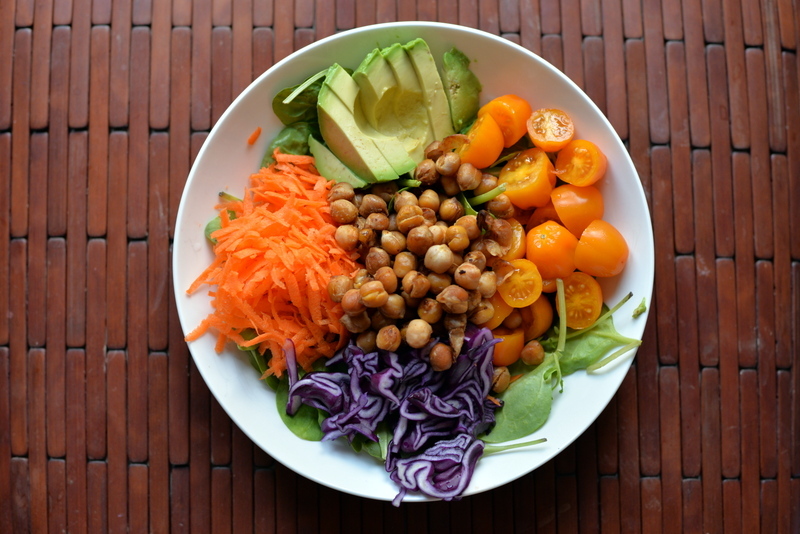 I can eat chickpeas all day so this recipe is good for me. And I would love the book! 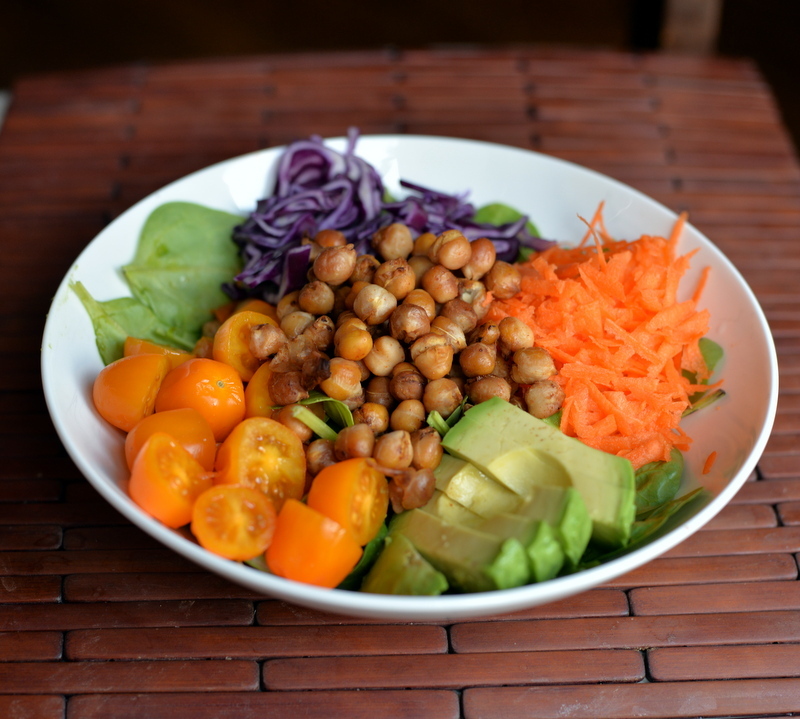 Another beautiful salad Janet – sounds like an interesting book – it is a shame that healthy food and diet get confused as people seem to often dislike the idea of “diet” and yet I know when I eat good healthy food it makes me feel good. Tomatoes in season. I only eat them when I can get them fresh and local, so in the late Summer/early Fall I truly eat them in abundance, as it has to tide me over ’til next year! Since we have an abundance of them in our garden now, I would have to say tomatoes! Potatoes are another favorite! This book looks great. I could eat potatoes in some form for every meal, I love them so much!! I eat so much roasted broccoli and cauliflower – LOVE! At the moment I am eating lots of sweet corn with abundance! Hi Sara, Congratulations! You are the winner. Please check your email. Hey Janet. Just came by to see what you’ve been up to and noticed this review — I love Somer’s recipes 🙂 — her cheddar is AMAZING. 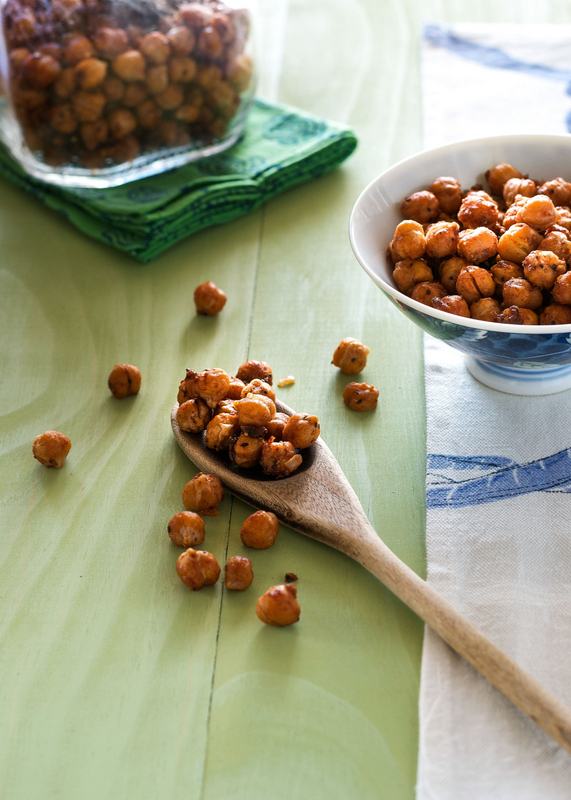 And these smokey chickpeas sound great too! Frozen bananas! A nice cool treat on hot summer days. I love salsa and guacamole. I just can’t get enough of them.